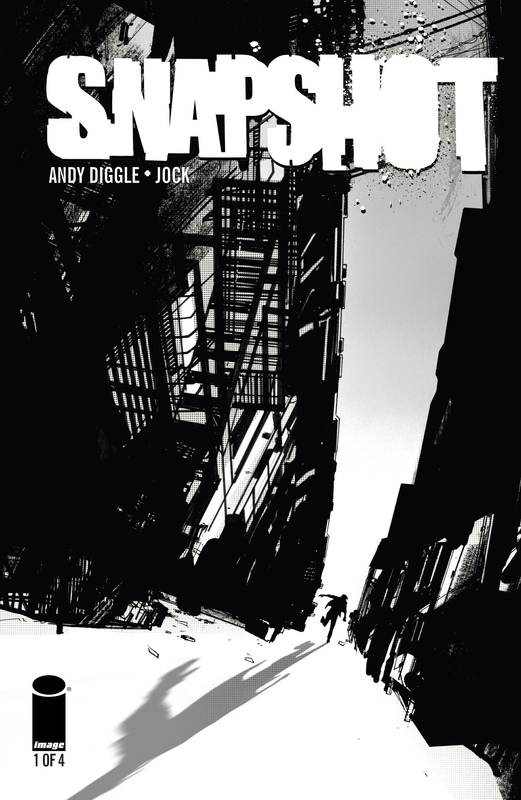 Writer Andy Diggle and his artist partner Jock, most famous for Green Arrow: Year One and The Losers, deliver to us Snapshot via Image Comics. This will be their first ever creator-owned work, and promises to be an exciting crime thriller. Do the dynamic duo have what it takes to truly pull off a creator-owned comic? Find out with your Major Spoilers review! Snapshot #1 tells the story of Jake Dobson, a comic store employee that finds a phone containing pictures of a seemingly murdered man. If this feels like the set up to an action movie, then you are having the same feeling I had. Everything about this makes it feel like a movie pitch, especially the pacing and the “too perfect” dialogue. The dialogue just flows in such an unrealistically smooth way that it added a barrier between me and the characters. Its not exactly cliché dialogue, but its the kind of stuff you might hear in a sitcom between two friends. It then shifts to thriller dialogue in the more “intense” moments of the book. The central conflict seems interesting, I won’t spoil it, but its definitely mysterious. It has me really wondering how they are going to resolve it, and I hope it does not have any kind of paranormal explanation, that would just feel cheap in this case. I know Jock has a lot of fans, and its understandably so with his style. I can see where the appeal is. But in this it just did not seem all that impressive. Nothing felt memorable, no single panel or page really stood out. It all felt the same. His liberal use of shadows got to be very distracting at times, adding emphasis on things that just did not seem the least bit important. Jock sure does know how to draw a facial expression though some really great work there. Despite my problems with this book, it was still worth the $2.99 I spent on it. I am most likely going to read the next issue, just to see how the mystery builds. If you want a good, new, thriller comic to read, than this is right up your alley. If you liked either creator’s previous works then you will probably like this too. As a young boy my parents showed me a movie. This movie involved dinosaurs, in a park, on an island. I was so awestruck by the fantastical idea. "Dinosaurs? Interacting with HUMANS?!?" From that moment on I was a bona fide geek. I loved it all, cartoons, movies, video games, everything. Unfortunately comics eluded my radar until middle school, when my father handed me a trade paper back of Marvels. The rest is history.